So, first I'd like to start with "A Cup Of Kindness". We sing about that on New Year's Eve so I thought it was a great theme for a mini kit. This mini kit has ten beautiful papers and twenty-eight elements, so it's slightly larger than a 'mini'. 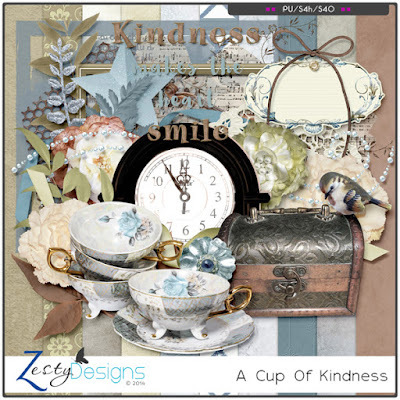 It has a soft palette of blues and neutrals and it is reminiscent of times spent with family, friends and neighbours. 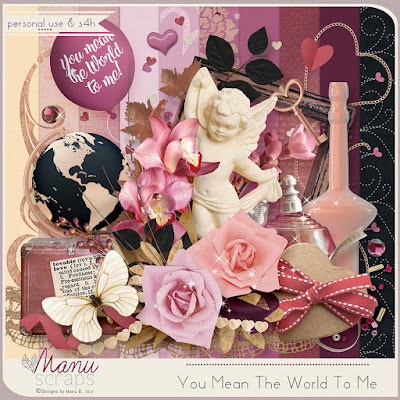 I'm also excited to announce that my very good friend, Manu, of Manu Scraps and I have put together another beautiful collab called "You Mean The World To Me." 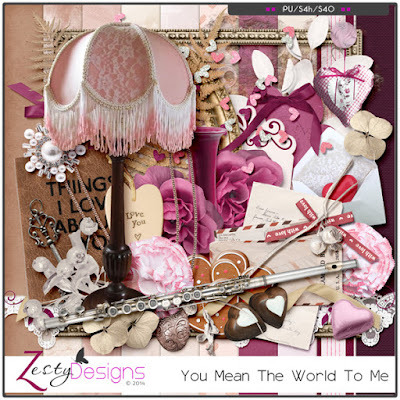 We each created a kit with 10 gorgeous papers and forty elements, using the same palette of pink, magenta and beige. These are perfect kits for Valentine's Day, anniversary, date nights, or any special romantic memories! We created a special deal too! 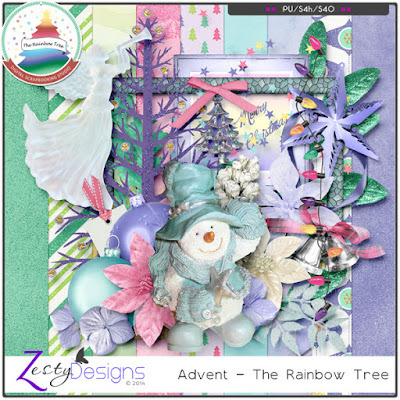 Both our kits are 30% off until the end of January PLUS if both are purchased together, you receive a FREE bonus pack of fabulous borders and clusters! See in store for details. 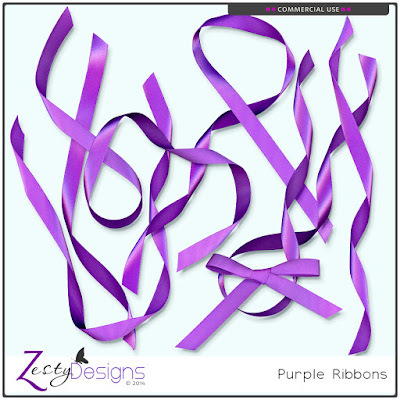 My Newsletter this week has a beautiful gift created by one of CT girls too! Don't miss it!! $2 Tuesday - Fresh 'one day only' specials on Tuesdays. I have some CU packs and some PU products - each for only $2. These are great bargain buys!! February isn't far away and I have more new products almost ready to release - a fabulous new collection and a couple of mini kits. I'm hoping to have some new Commercial Use products in February too. That's about all I have for now. Stay warm if you're in a cold country and stay cool if you're somewhere hot and humid, like me! ADVENT CALENDAR time at The Studio! It's that time of year again when we have our annual Advent Calendar event at #theStudio. The Designers have created beautiful mini kits - one for each day through December 25 which are our FREE GIFTS to you! Don't miss a one. TODAY IS MY DAY - and my store is also 40% OFF for TODAY ONLY. Stop by each day and collect the rest of these wonderful gifts - our thank you to you, our loyal customers! Instant Replay and Encore...Don't miss it! Thanksgiving is almost here. Then it will be followed by Black Friday and a weekend of sales and surprises! We don't have a special day for Thanksgiving here in Australia - probably because the Pilgrim Fathers didn't come to Australia and didn't befriend the Native North American Indians. That said, we do however, still find the benefits in gathering together with family and friends to give thanks for all our blessings. I hope you have a wonderful Thanksgiving Celebration! Black Friday is indeed another thing entirely! Ask most Aussies and they can't tell you a thing about 'Black Friday' - other than Friday 13th being called a Black Friday. For our North American friends though, we understand that you like to have a big day out for shopping in order to grab great bargains which must be a wonderful boost for your Christmas shopping!! 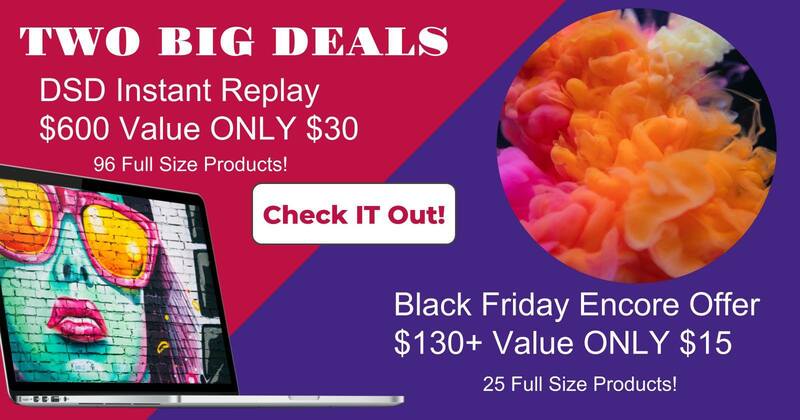 To capture the essence of the "Black Friday" Sales, I want to share with you the INSTANT REPLAY. Did you think we were finished with the awesome Big Deal from DSD? Well, nooo! Because it was so well received, we decided to bring it back for Black Friday. If you missed purchasing during DSD I've got news for you. You can still buy this fabulous bundle of goodies from a whole bunch of great designers - over $600 worth of product for just $30!! You'll ooohhh and aaahhh as you open each download to discover oodles of beautiful products to keep you scrapping well into 2019! For Black Friday weekend, we decided to offer an extra bargain - more gorgeous kits and collections as an ENCORE! 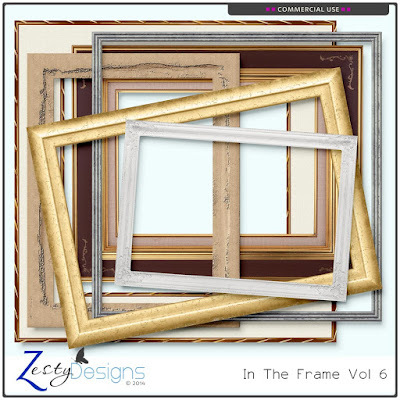 The designers have put together a bundle with 25 full size products, valued at over $130. YOU PAY ONLY $15.00!! How can you afford to miss this? Check it out now: http://bit.ly/2zJQMQl or go to my Facebook page. Buy now before the Black Friday shopping rush. Get a start on your Thanksgiving scrapping. 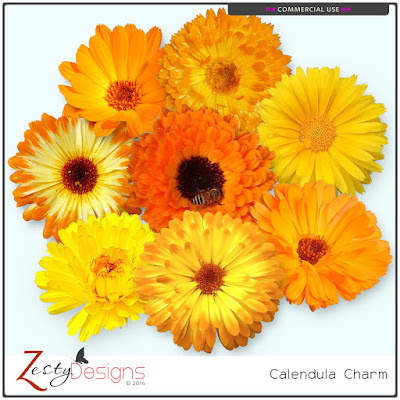 Enjoy your beautiful new products!! Before we get on to the new stuff...let me give a gentle reminder that the DSD After Party is still running. See my previous post for details of my After Part Special and don't forget - I have an exclusive FREEBIE made with "Mountain Air" for new subscribers to my NEWSLETTER. NOW FOR THE NEW STUFF! Build your own collection with $1 single packs or for BEST VALUE, buy the BUNDLE $8.00! I took a more vintage approach to the theme so if you love 'old' I think you'll love this. 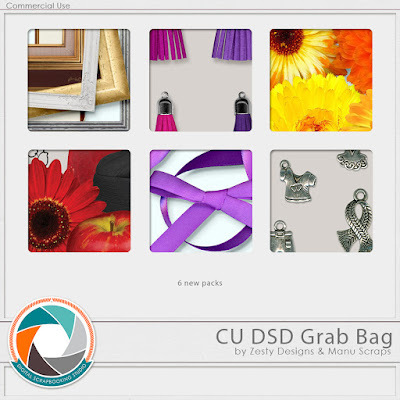 These packs were part of a DSD CU Collab Grab Bag - now in store separately - and on sale! I'm about to go vacation and I hope I'll have some great photos to scrap with when I come home. THE DSD POST PARTY IS HERE! The DSD BIG DEAL IS OVER but we had such a good time, we decided to have an AFTER PARTY and continue with our SPECIAL OFFERS for just a little longer! Shop AFTER PARTY GUIDE - E-Book - to take advantage of all the great deals and special coupons. One of my all time favourite collections is "MOUNTAIN AIR" - it's a wonderful collection for any time of the year and has an outdoor focus. I love this palette! NEWSLETTER SIGNUP - FREE GIFT! If you'd like to be part of the Buzz...request to join. We'd love to have you. Have you 'liked' my page? Keep up with all that is happening - special events, sales, new products, etc etc, as well as all the beautiful pages my wonderful CT ladies create. I stock Personal Use and Commercial Use products. My Commercial Use products have been Quality Checked. Enjoy the After Party Event! I hope you find some great products at wonderful prices! 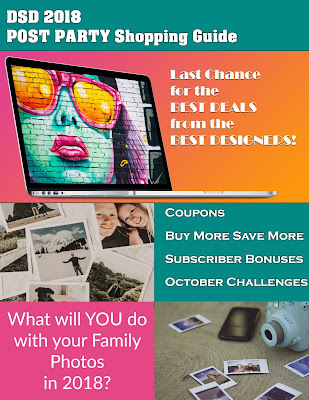 Digital Scrapbooking Day - Saturday October 6, 2018. I wanted to quickly outline some of the amazing events that will be taking place over this weekend. 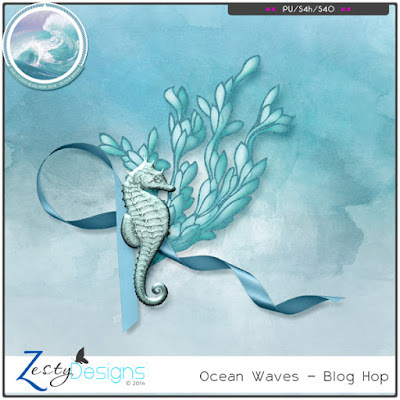 As you can see from my previous post, The Ocean Waves Blog Hop has already begun. Don't forget to collect all the pieces...you'll have a wonderful collected if you do! FLASH SALES!! We all love Flash Sales! Flash Sales will change each day (Oct 5,6,7) so keep your eyes open for these fabulous $1 Sales - both Personal Use and Commercial Use. NOTE: FRIDAY FLASH SALES ARE ON!! BUNDLED DEALS!! Another great way to save big time. I have two bundles included - both 4 for $4.00 bundles. One is Commercial Use and the other is Personal Use. Check these out if you want to take advantage of these bargain buys. This is by far the best value during DSD 2018. Twenty-four (yes, 24) designers have put together a totally fabulous DEAL that you can purchase for just $24.00. OVER $600 IN PRODUCT! It's available at this price for a very limited time...so you need to be quick for this one. Please do yourself a favour - don't miss out! I'm giddy with excitement - if I've left something out, I'll come back and add it in, but that's it for now. DSD BLOG/FACEBOOK HOP 2018 HAS BEGUN! The DSD Blog/Facebook Hop is now on! On the Studio Blog, you'll find a list of all participating designers - collect each piece and you'll have a wonderful themed collection. 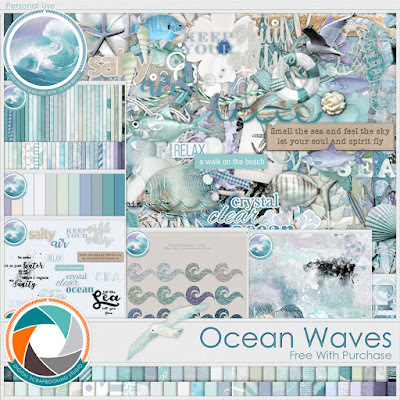 We've also put together another whole Ocean Waves Collection which is being offered as a Free With $15 Purchase during DSD weekend. THIS IS JUST PART OF THE DSD FUN! !